Can you believe that it's almost the middle of December? I know, right? Where has the time gone?? I know for me the start of the month has been busy with listing bags in the shop, packaging and shipping orders, waiting for at least half an hour in line at the post office, and then these past few days I've been hit with the flu and had to put everything on hold as I holed myself up in bed. I'm still not 100% but at least my entire body doesn't ache any more and I think my body temperature is back to normal. But since I had the worst sleep last night (re: the kind of "sleep" where you are half awake/half asleep but the sleep is so light that you're not sure you're sleeping...all while your brain is going a mile a minute and nothing you do will turn it off), I don't think I'm capable of stringing together a coherent blog post. So...like my sleep, here are a bunch of random thoughts in one post. ♥ First off, muchos thank yous to everyone who entered the Imperial Yarn and Journey eBook giveaways!! I thoroughly enjoyed reading all the responses and especially loved that so many beginner knitters are planning on giving garment knitting a try in the new year! Some of you are even wanting to venture into the world of knitting cables. To both groups: GO FOR IT!!! You won't regret it!! Imperial Yarn :: Katherine P.
♥ I totally realized last night that I didn't post a November Obsessions list! Oops!! I had even started it and then got so busy with orders that it just slipped my mind. If you still care to see it, stay tuned, as it'll be my mission to have it posted this weekend. 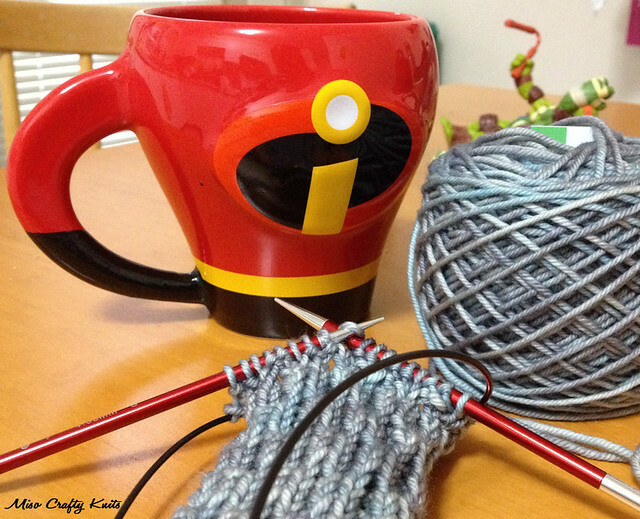 ♥ Lately I've been feeling a little scatterbrained about my knitting projects. There's just so much to knit and so little time! I'm starting to feel guilty about all the projects that I have on my needles and should really buckle down and get to finishing some of them. Or at least blog about them! ♥ I've also been working on quite a few projects in the background. Some are knitting related that I'm not allowed to talk about yet and some are in the prototype stages sitting next to my sewing machine. ♥ Last Friday I was "Harloted"!! Check out the Yarn Harlot, Stephanie Pearl-McPhee's blog post here to see my large box bag (it's the brown one with the orange, yellow, and magenta "stitches") next to the likes of Tom Bihn, Della Q, and Splityarn. ♥ I think being Harloted was the main reason why I was so busy last week. Thank you, thank you SO much Stephanie!! I honestly wasn't expecting a shout-out from such a knitty big name. It still makes me giddy! ♥ I've tweeted but not blogged about my adventures in making my own kombucha. A few days ago I finally got to bottle my first batch! I was a little disappointed that I had let my batch ferment way too long and tried to "fix" it by adding some organic fruit juice before doing a second ferment. I finally opened a bottle to taste yesterday and you know what? It's not too bad! It's not at all fizzy like I was hoping it would be, but not bad considering that it's my first batch. I've already got a second batch fermenting and this time I'm definitely going to make sure it doesn't go for too long! Have/Are any of you brewing your own kombucha? Got any tips for this newbie? I would love to hear them!! ♥ I'm SO excited that the Pantone Color of the Year is actually "Radiant Orchid" and not that brilliant blue that was originally predicted. Not that I'm biased or anything based on Pantone's description of Radiant Orchid; "a captivating harmony of fuchsia, purple, and pink undertones", but I can definitely get with this shade. Hmmm...I wonder if I subconsciously knew about this colour decision before it was announced because these past few months I've been looking at a lot of purple yarn! ♥ Speaking of yarn...I may or may not have "rewarded" myself by purchasing 2 skeins of delicious self-striping goodness from Jessie of Yarntini. Would you blame me if I did since these delectable skeins are a whooping 10 stripes each?? Yes. You read that right. I said 10 stripes. Each. I'm seriously drooling here. I can't wait to get my grabby hands on those skeins. ♥ I know I say this every year, but I have a feeling 2014 will be the year of the sock. ♥ Maybe it's because of the aforementioned yummy self-striping yarn that will soon be in hands, or the fact that said hands are already equipped with a several new sock needles? Whatever the case, bring on the socks!! Thanks Sarah! :) I think I left my first batch to ferment much longer than I would have liked because it tasted a bit too much like kombucha vinegar and I was hoping for something slightly more sweeter than that! I tried to "fix" it by adding the juice but I think it fermented faster than I had anticipated because even after 4 days there was no fizz and the kombucha didn't taste any sweeter. I'm thinking of adding flavour every second batch and was hoping to put actual fruit into my bottles than the juice. I've heard so many people mention the ginger that I think I should give it a try! OMG! Thank you so much for hosting this giveaway! I am SO excited to get started on the projects in this book! You totally made my Christmas! YAY!! I'm so happy that you're happy!! :) Keep me updated as to which patterns you make! But I can already tell you that "Spate" is first on my list! I was eyeing that 10-stripe Yarntini yarn myself, but didn't pull the trigger because I have a boatload of sock yarn to be knit already. Can't wait to see yours all knit up. OOooohhh...I'll definitely check out that Plucky colourway! Not that it'll help since I always miss out on the Plucky updates! It seems that I'll set 10 alarms so that I don't miss it, but then something happens that needs my dire attention and BOOM! I miss the update. Grrrr....!! !